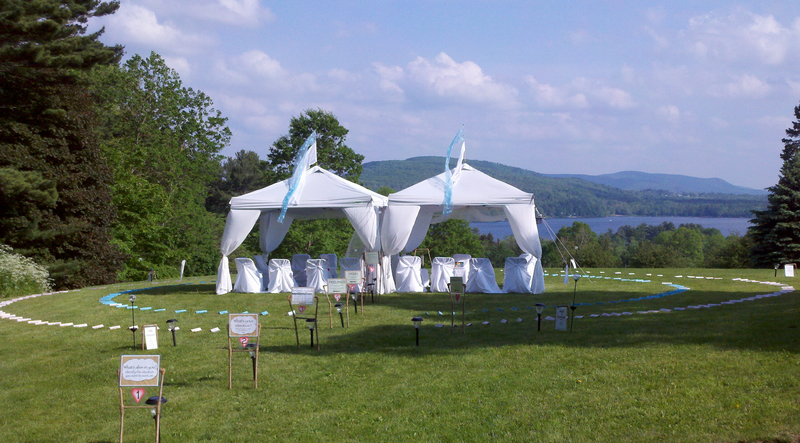 "Fostering Joyful Empathic Heart-to-Heart Connection." What is the EL ? 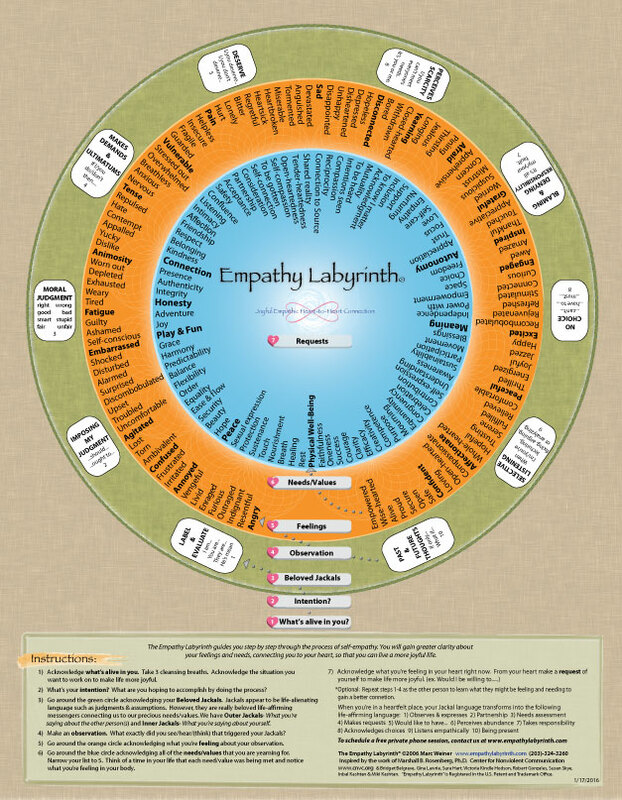 The Empathy Labyrinth®, was developed by Marc Weiner in 2006 as a tool to teach empathy skills and Compassionate Communication. The EL is inspired by Marshall Rosenberg's Nonviolent Communication (NVC). When you want to connect to what's going on inside you, you first need to identify your thoughts, feelings and needs/values. The EL provides an emotional vocabulary with over 250 feelings and needs/values words. The EL is laid out in 3 concentric circles. The outer circle includes ten different beloved Jackal thoughts (i.e., habitual judgments, assumptions, & the like). The middle circle has 125 feelings words. And the inner circle has 125 needs/values words. beloved Jackal thoughts* (*Jackal thoughts appear to be life-alienating habitual thoughts such as judgments & assumptions. Empathy connects you to your heart. Labyrinths connect you to your heart. Together you get Heart-to-Heart connection. Your heart and mind open to new and previously unthinkable possibilities of connection. A personal, psychological & spiritual transformation. Identify the situation in your life that you would like to work on. Go around the EL identifying all of your feelings. Go around the EL identifying all of your unmet needs/values. Then narrow them down to about 5 needs/values. Now imagine each of your unmet needs/values being met. Take your time. Notice what you’re feeling in your heart. From this place of heart connection, would you like to make a request of yourself or the other to make life more wonderful? Try to imagine what the other person is feeling and needing. 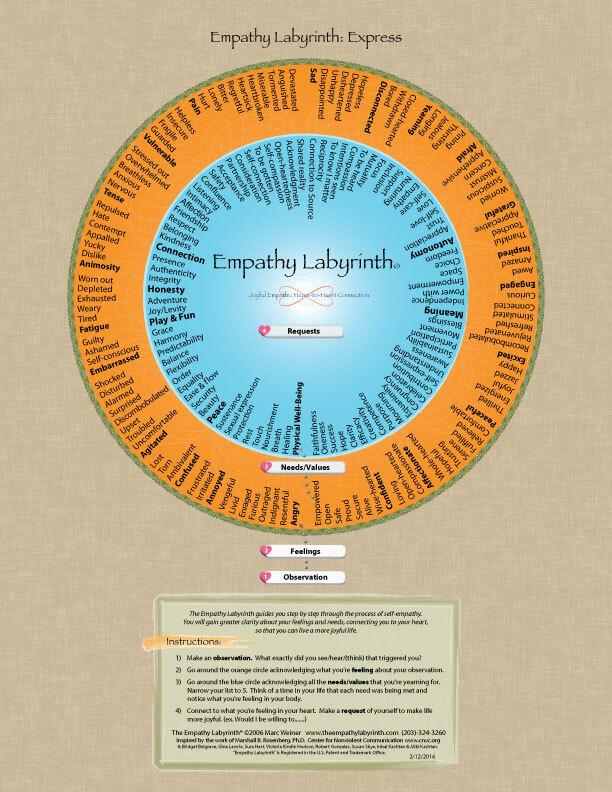 Click here for the full EL Self-Empathy Worksheet. Need help or want to experience this profoundly transformative process with an EL facilitator click here to contact us. Our goal is to teach a simple yet profoundly transformative process to help you foster heart-to-heart connection. This same simple process for connection can be used to foster heart-to-heart connection with yourself, with others, and with your beloved Divine power. Copyright 2019 The Empathy Labyrinth.